Marco Power Solutions Pvt. 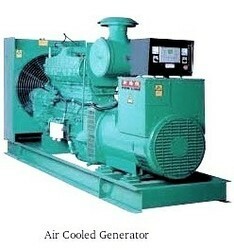 Ltd.
We are reckoned as one of the prominent service providers of Air Cooled Generators on Hire. Our generators offer the clients with a reliable and constant source of power supply during times of emergency like power cuts, power failure etc. Since power supply is the main source of all functions in today’s world, it becomes imperative to have a reliable back-up for the same to be brought into use when the normal power supply fails. These generators are made of quality-approved components. They are available to clients on rent at much cheaper prices than their selling price. Thus, they are easy on the client’s pocket. Moreover, they are highly acclaimed for their reliable operation. They are easy to install and damage-resistant, which makes them suitable for rugged use as well. We offer them on rent at nominal charges. Ever since our establishment at Mumbai in the year 1960, we, Marco Power Solutions Pvt. Ltd., have emerged as one of the prominent Service Providers of Mobile Generator Rental Services. We are also engaged in offering turnkey services. We help our customers enjoy a long-lasting power back-up with the help of these generators. Our generators provide efficient and durable power solutions to clients without them having to make a long term investment. We have a strong logistics network that helps us in delivering the products at the clients end on time. Our services are provided in a timely and efficient manner as per the clients desired requirements and are highly acclaimed for their efficiency. They are provided to our esteemed clients at economical rates. Our services are offered to our valuable clients at affordable costs.